God (Marlon Brando) was on the phone. He sat in his office at the Centre of the Universe, huge and mighty, but slightly the worse for wear, with his thinning white hair and beard. God had gotten old. He spoke slowly and lethargically, punctuating the end of every sentence with a heavy nasal puff. The dim Universe stretched out before him through a scenic window opposite his desk, and a radio hummed gently somewhere in the background; a pop tune from planet 607: “Blame It On The Boogie”. God was chatting to a colleague in the next Universe. After the big and ambitious Author of Iceland, Helgason published the short and comic sci-fi novel Mr. Universe, written in Italy in the summer of 2002. Written as a mock Hollywood blockbuster movie, it tells the tale of the fight between God and mankind. God lives on a small planet, Planet Zero, in the Centre of the Universe, managing all his 716 different mankinds on as many planets. One day he learns that his mankind on Planet 607 (Earth) has managed to clone itself. God gets angry and decides to kill off this annoying mankind and replace it with a new one. When the deceased souls from planet 607, who reside in the VIP camps at Planet Zero, learn about the big boss’s plan, they decide to try to save their planet. Their leader is Napoleon Nixon (a soul that has been both men) who leads the operation against God, a journey that takes him inside Planet Zero, where the Devil reigns. Keeping in line with the movie-like “ciné-roman”, all the characters of the novel are cast by the author. God is played by Marlon Brando, Woody Allen is his assistant, Salman Rushdie the scientist in charge of creating a new mankind. 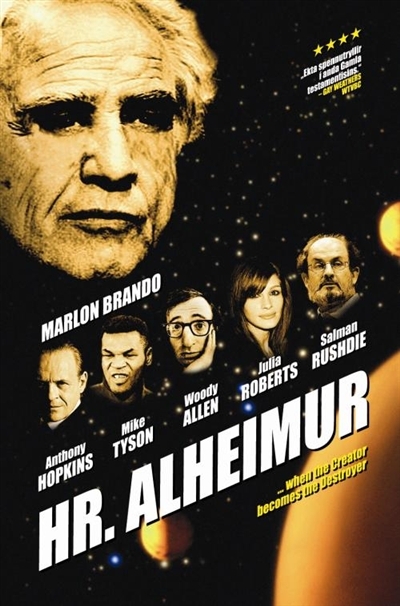 Anthony Hopkins is Napoleon Nixon and his muscular assistant is played by Mike Tyson. In the role of the Devil is Leonardo DiCaprio. Mr. Universe was published in France, in 2015, under the title “La grosse colère”.